Is it just me or has this year been terrible for observing? I've wanted to not only get outside more and do some "solo" observing, but even many of the public events I've been to since the beginning of the year have not had good weather. I had one event two weekends ago that was good, but other than that, it's been clouds, clouds, clouds. Heck, you can usually count on at least days around full Moon to be clear even if the new Moon one's aren't, and this year hasn't even had much of THAT! One the bright side I've gotten a lot of equipment work done: Built a new adjustable observing chair, put some shellac on the tripod for my tabletop scope, and tonight finished building a camera bracket to take better afocal photos with my cell phone. But I fear I may not see the stars again anytime soon... anyone else think this year has been crappy for observing? I know it's been a bad year for observing personally. With the polar vortex winter, a cloudy spring, and working two jobs from late July to late October, I haven't had much observing time. Most nights when I have been free the second half of the year have been cloudy, with a few exceptions. As a lunar observer first and foremost, I've at least got in a decent amount of lunar observing, but not much else. Two of the three most important observing dates for me, the October lunar and solar eclipses, were at least partly successful. 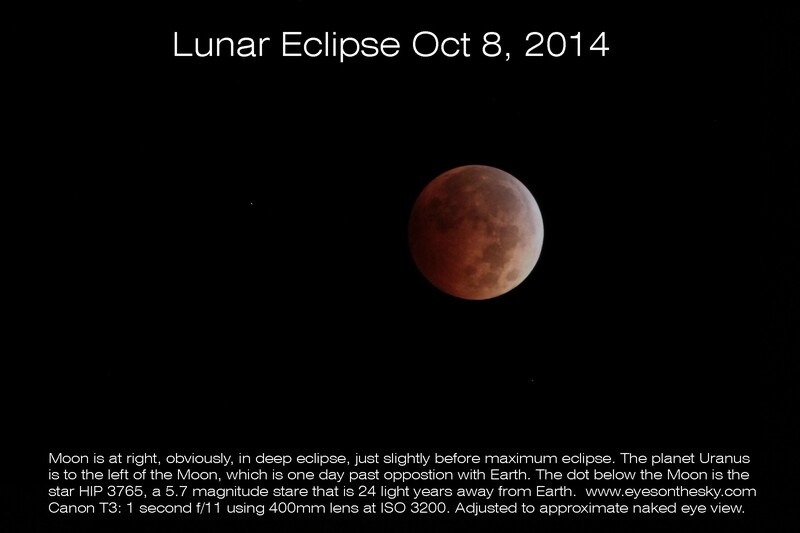 The lunar eclipse was my first totality as an astronomer. The partial solar eclipse was also the first I've observed since taking up this hobby, and by oversleeping, I was lucky enough to be at the site in the region that seems to have had the most minutes of sky during the eclipse. I think I only made it out to one Chicago Astronomer star party this year. The Valpo parks asked me this spring not to bring my telescope to the park. Most of our Calumet Astronomical Society events, public and private, were clouded out. It's been a rough year for observing. Agreed Paulie. I know i was fortunate to capture the lunar eclipse. It was the first one I'd seen in quite a long time, and I actually managed to get up early in the morning and take some photos. I'm also grateful that at least he daytime sky was clear when AR2192 was at its best. 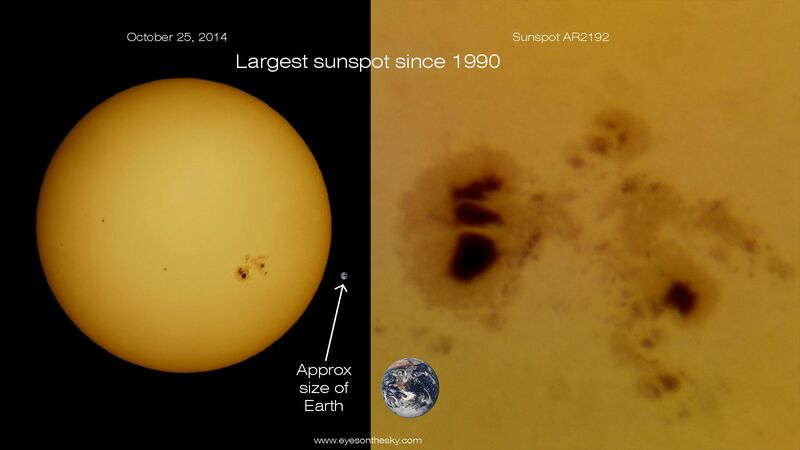 The largest sunspot in 20+ years? Yes please! But after that? Only one outreach event the second half of the year that wasn't completely clouded out. And I haven't made it to even one of Joe's events, because I was either busy, or the clouds just looked like there weren't going to allow for much, so I didn't make the trip in to the city. Too many cloudy nights this fall so far. 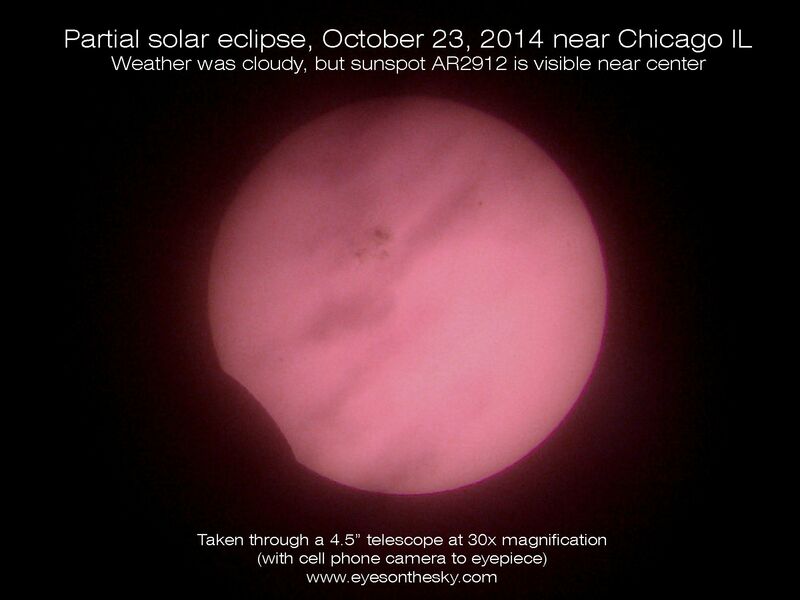 The Chicago Astronomers were not able to conduct a single full Moon rise session in 2014. I did intend to strip down the C11 and give her a good cleaning, but that too fell by the wayside. Just ain't enough time...! 2015 better be better...just sayin'. The last two years have not just been down years for observing, but have had quite a bit of turmoil and instability for me. Due to my great family and friends, I can't say they were bad years, but I really need 2015 to be better. Let's hope the sky conditions on Full Moon nights improve enough so that you can conduct observing sessions during every warm month in 2015. The data in red are for the dates when the rising Full Moon will be most fully illuminated each month. That may be in conflict with Full Moon dates given on calendars, mainly because a Full Moon transits the local meridian around midnight when the date changes.